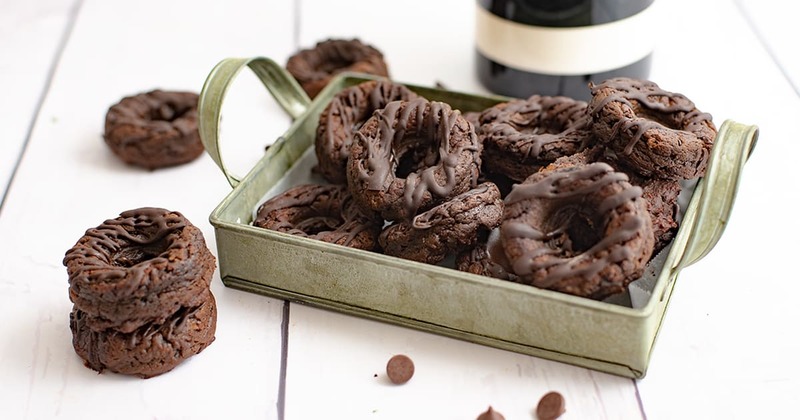 These chocolate mini gluten free donuts are pretty much my most recent obsession. They are gluten free, vegan, protein packed and super simple to make! Oh and I should probably mention they are incredibly addicting. 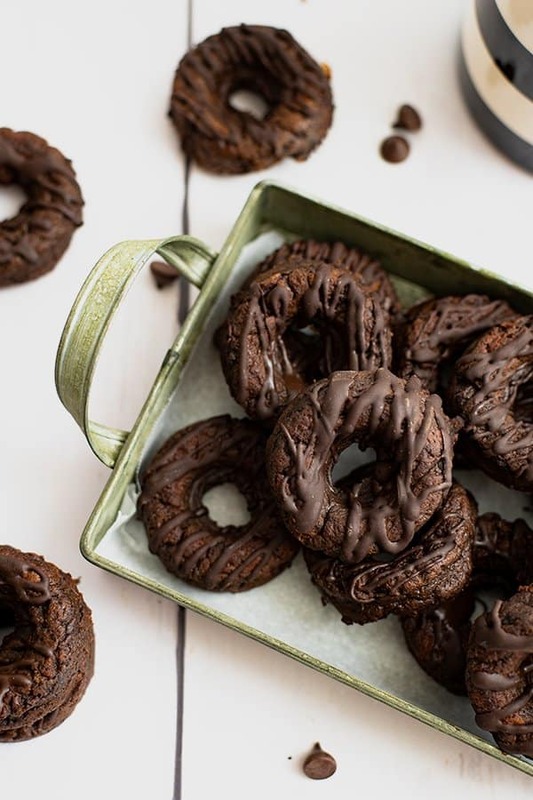 I have made these chocolate mini gluten free donuts so many times I have the recipe memorized and I can’t keep them in the fridge for more than two days. Dave and I may have a slight addition! But really can you blame us? These little mini gluten free donuts are a healthy indulgence – they are baked in the oven, made with protein powder and banana and have no added sugars or sweeteners, not even stevia! But don’t let that scare you. 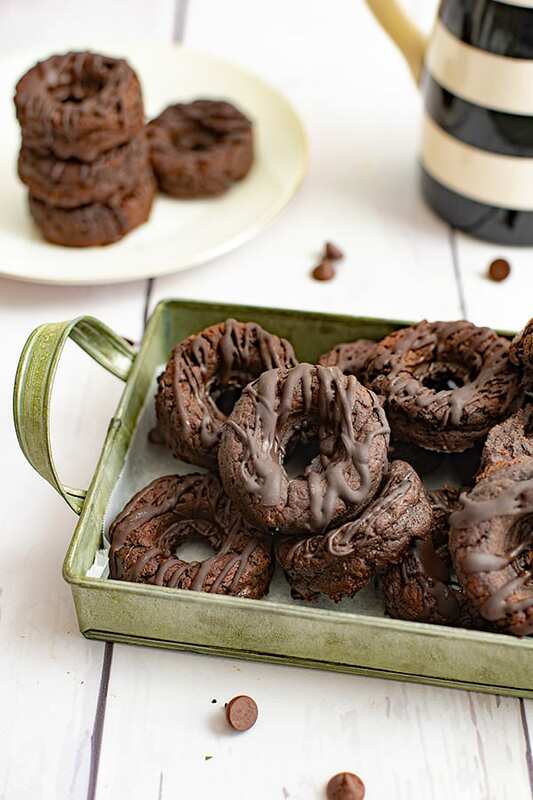 These little chocolate donuts are packed with flavor and are crazy delicious! Is it difficult to make donuts in the oven? Nope! It’s almost as easy as cookies! I ordered two different size silicone donut molds from Amazon, but I have to admit that I love this mini donut mold (affiliate link) the best for vegan recipes. These mini donut molds never stick and they don’t take up much room in the kitchen cabinets when I’m not using them! If you don’t have a donut pan but you want to make these, have no fear! 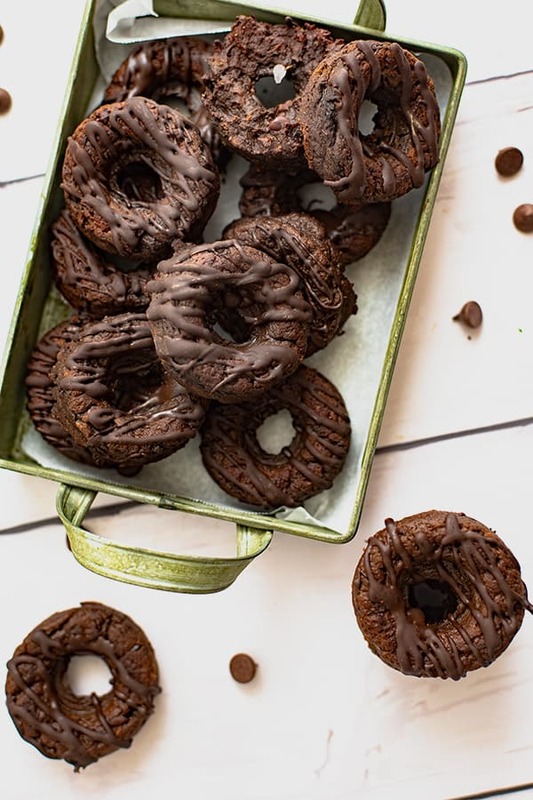 I actually wrote a tutorial on how to make donuts without only a muffin tin and rolled up parchment paper in this chocolate zucchini donut recipe post. But I have to admit the silicone molds are SO MUCH EASIER! 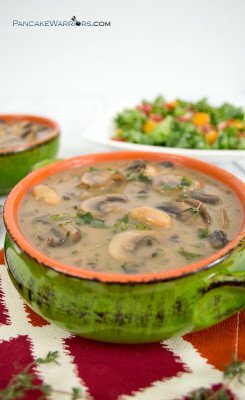 Does it matter what protein powder use for this recipe? The short answer is yes. Plant based proteins act very differently than whey, collagen or egg white protein powders, so I would really recommend you find a vegan (plant based) protein powder you love. 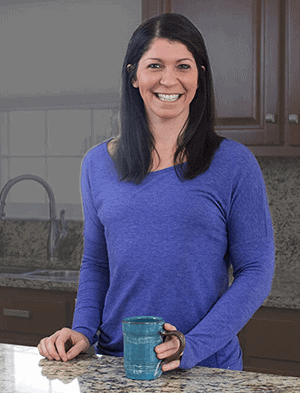 I personally have been using Nuzest Clean protein powder (affiliate link) for all my baking. I love that they don’t add any stevia or sweeteners and they are very careful about the sourcing of their peas (it’s a pea protein powder). This protein has not caused any digestive discomfort for Dave which is huge for us, since so many other brands were causing stomach issues! Use the code below to get 15% off your order at Nuzest! How do you make gluten free donuts? These donuts are made gluten free by using a mixture of gluten free flour and the vegan protein powder in place of traditional wheat flour. I used tigernut flour (affiliate link) in this recipe. Tiger nuts are a small root vegetable (like potatoes or beets). The tiger nut flour is grain free and is also a great source of resistant starch! Resistant starch is a prebiotic fiber that actually feeds the good bacteria in your gut! If you don’t want to use tigernut flour, you could also use your favorite gluten free flour or oat flour (made from grinding up gluten free oats in the food processor). How do you make vegan donuts? 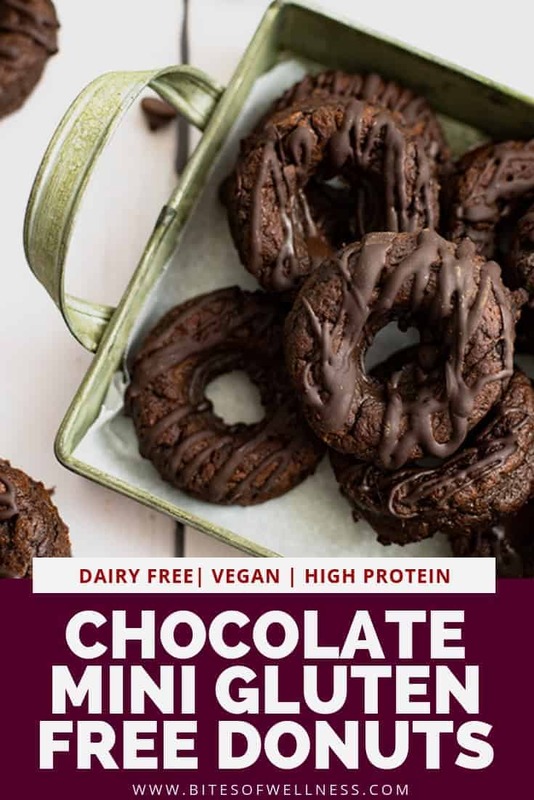 It’s important that you replace the eggs in traditional recipes with an egg replacer in vegan recipes to get the right texture for these gluten free donuts. For a long time I was using chia seeds, but the food sensitivity test from EverlyWell (affiliate) that Dave took back in February indicated that he was having a sensitivity to chia seeds as well as eggs. This kind of forced me to find other alternatives to eggs in my baking. I love using ground flax seeds, however I was showing some sensitivity to flax at the time. So I started looking around at other alternatives and asking people on Instagram for suggestions. A few people suggested psyllium husk powder, and from that suggestion I also found that Bob’s Red Mill makes a pretty awesome gluten free egg replacer (affiliate link). So I ordered both and started testing. What I found was that I really like the consistency of the recipes with the egg replacer, so I make sure to have a full bag of that in the pantry now for all of my baking! However I believe this recipe would work well with 2 tbs. of chia seeds or ground flax seeds in place of the egg replacer that is in the recipe as written. PS if you are interested in learning about your own food intolerance, the test from EverlyWell (affiliate) was a great place for us to start! You can use the link to get 15% off your test! 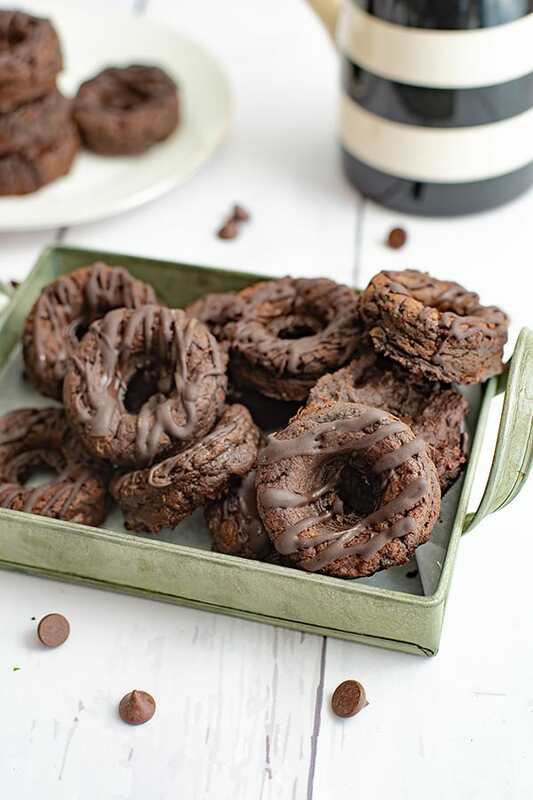 These chocolate mini gluten free donuts are the perfect way to satisfy your sweet tooth! Packed with protein and no added sugar, these donuts are a healthy indulgence. 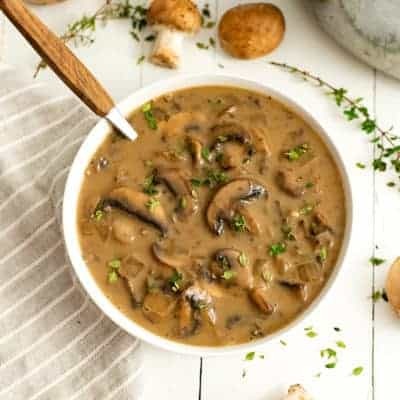 Gluten free, grain free, vegan, paleoish, and so simple to make! Add the protein powder, cacao powder and tigernut flour to the bowl of wet ingredients and mix well. After the wet and dry ingredients are incorporated, add the sunbutter (or your favorite nut butter) and stir well. Add the baking powder to the mixture and stir well, being sure to fully incorporate into the mixture. Add the unsweetened chocolate to a small ceramic bowl or glass measuring cup. Melt the unsweetened chocolate in the microwave in 30 second increments, stirring well between. This usually takes 1 minute total. 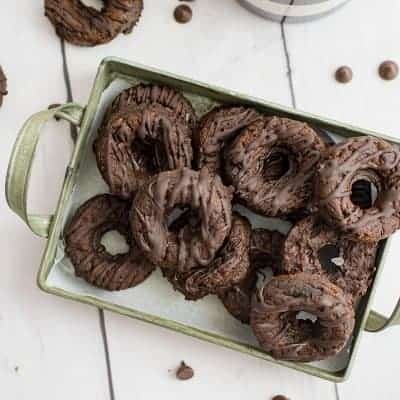 Once the chocolate is melted, take the donuts out of the fridge and drizzle the chocolate over the donuts using a spoon. Store the donuts in the fridge up to 5 days in a sealed container. These were gone in under an hour in my house. Will definitely be making again! I need these in my life ASAP!!! I have been craving doughnuts! I also just bought a silicone doughnut pan that I plan to break in this weekend. I want to make sure I get the recipe right. Can I use a regular egg or egg white? Or if I use chia seeds who much do I need? Also 1 tbsp?
? ?for leg day Saturday!!! ?? Hey Jen 🙂 Ok so I haven’t tried this with eggs but I’m guessing you could use 3 egg whites instead of the egg replacer and you would get a similar texture. If you wanted to use chia seeds, I would use 2 tbs. of chia seeds. Let me know how they turn out! !